Nevermind the saccharine-sweet and, sometimes just plain obnoxious skits; the Lawrence Welk Show ran nationally on ABC for nearly 28 years. Welk’s bandleading style and arrangement lead to the term “champagne music”, which is what he called his orchestra. Here they are with, ahem, If You Can’t Get A Drum With A Boom, Boom, Boom. Get A Tuba With An Oom-pah-pah. 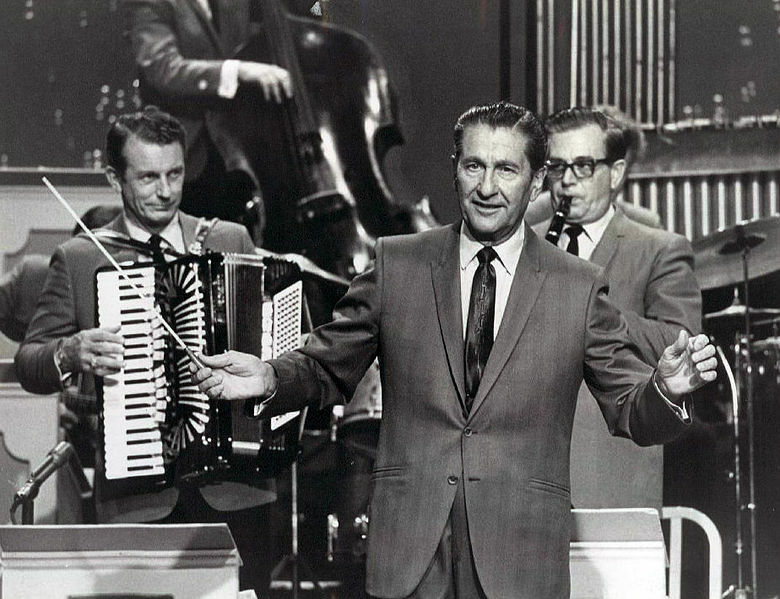 Welk’s famous accent actually embarrassed him in early years, prompting him to have someone else introduce musical numbers. But the public seemed to love the “and-a-one, and a-two”s and the like. It might have surprised said public that Welk was born in…South Dakota. Strasburg, actually, in a community of Germans from Russia, a name given to ethnic Germans who left the Russian Empire. Want to see the very first pilot of the Lawrence Welk show? Go to Soundbeat.org right now.